A110-10 VOLUNTARY NOISE ABATEMENT PROCEDURES IN EFFECT. FOR NOISE ABATEMENT PROCEDURES CALL 480-644-6647. A110-11 RISING TERRAIN NE OF ARPT. A110-12 BIRDS INVOF ARPT. COYOTES AND OTHER WILDLIFE OCNL CROSSING RWYS AND TWYS. A110-13 RWYS 04R & 04L ARE THE PREFERRED RWYS WHEN WIND CONDS ARE LESS THAN 5 KNOTS. 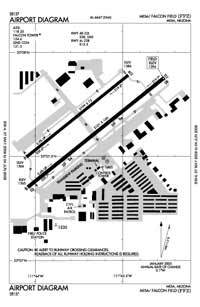 A110-14 REPETITIVE TRNG OPNS USE RWY 04L/22R WHENEVER POSSIBLE. AVOID REPETITIVE TRNG OPNS 2200-0530. A110-15 RWY 04L/22R CLSD WHEN ATCT CLSD. A110-17 BLAST PADS INSTALLED ON RWY 4L AND 22R. BLAST PADS DIMENSIONS, 150 FT X 95 FT.
A110-2 2786 FT MSL UNLGTD MTN 5 MI EAST. A110-4 TURBULENT CONDS MAY BE ENCOUNTERED BLO 500 FT AGL NEAR GND TEST SITE 1.5 MILES NORTH OF ARPT. DO NOT MISTAKE BOEING HELIPORT 1 MILE NORTH FOR A RY. A110-8 TERMINAL APRON AREA LTD TO 45,000 LBS GWT SINGLE WHEEL OR 75,000 LBS GWT DUAL WHEEL BY AIRPORT DIRECTOR. A110-9 EXTENSIVE FIXED WING AND ROTORCRAFT FLIGHT TRAINING ACTIVITY. A17 FOR SVC CTC FBO ON 122.950 (480-832-2582). A43-22L PAPI DOES NOT PROVIDE OBSTRUCTION CLEARANCE BEYOND 4.0 NM FROM THRESHOLD. A81-APT WHEN ATCT CLSD MIRL RY 04R/22L AND TWY LGTS PRESET LOW INTST TO INCREASE INTST ACTVT - 124.6. MIRL RY 04L/22R UNAVBL WHEN ATCT CLSD. FOR REIL RYS 04R & 22L CTC ATCT. E147 TPA FOR LIGHT ACFT 1006 FT AGL; TPA FOR LARGE & TURBINE-POWERED ACFT 1506 FT AGL; TPA 506 FT AGL FOR ROTORCRAFT.